The present-day Château de Fère was once a former wing of the adjacent castle, which is now in ruins. Robert de Dreux, grandson of Louis VI, built the original castle in the 13th-century. The property belonged to the royal family of Valois-Orléans-Angoulème until the mid-16th century. At that time, Louise of Savoy, mother of King François I, to Anne de Montmorency, once the most powerful man in France apart from the king. As governor-general of France and chancellor to six kings, he served as a warrior, diplomat, and patron of the arts. Among his building projects was also the famous château at Chantilly. Anne de Montmorency passed the castle to Connétable Montmorency and then to his grandson, Henri II of Montmorency. His treachery against Cardinal Richelieu caused him to lose his head, with his estate passing for a time into the hands of Louis XIII. Eventually the château made it into the hands of Philip Egalité, who, in order to seek approval by the Republicans during the time of the French Revolution, demolished a good part of his property. He further sold the furnishings and fixtures until nothing was left. The wing of today’s château was restored in 1863, and the gates were opened as a hotel welcoming guests in 1956. To best enjoy the gorgeous area and setting of the hotel, you’ll need a car. You’re also a bit far from shops and markets, so if you need anything like snacks for the room, bring them with you. Although you don’t need it for most of the year, rooms are not air conditioned. The village of Fère-en-Tardenois is west of Reims. From Reims, take A4, exit #21. Take N380 and D801 towards “Villers-Agron” and then to Fère-en-Tardenois. Look for “Fismes” direction. The castle is 3 km after the village. Not practical to reach by public transportation. 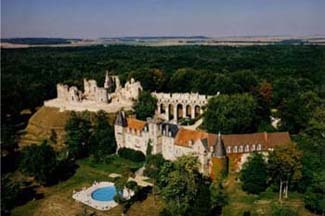 In a gorgeous, romance-filled location, the Château de Fère provides luxury accommodations in the heart of the champagne country. Set among woodlands and well-tended lawns, you cross over an ancient bridge spanning a moat to reach the property. Individually decorated guest rooms (recently renovated) look out over the gardens or the ruins of the nearby castle. All come with full bathrooms and flat-screen TVs. One of the main reasons people come here is for the reputation of the kitchen. Dinners are an event in a three-room restaurant enriched by 18th-century paneling, rich fabrics, artwork, and chandeliers beneath a beamed ceiling. The wine cellar holds over 10,000 bottles. Sometimes the château holds special evenings—such as dinner and opera.